Who doesn’t love a light, fluffy popover? 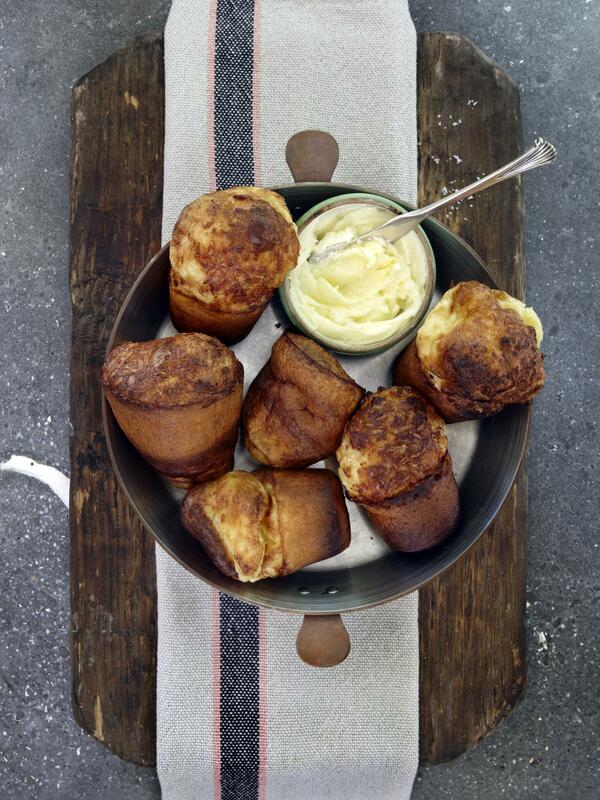 Fresh out of the oven, airy and warm, these popovers from Chef Tyler Florence won’t last long this Thanksgiving! Position oven rack in middle of the oven. Preheat oven to 400 degrees F. Grease 12 popover cups. In a medium saucepan bring milk to steaming (160 degrees F). Place eggs in a large bowl and lightly beat. Slowly add 1 cup of the hot milk to eggs, stirring until combined. Pour egg mixture into saucepan. Stir to combine. Strain mixture through a fine-mesh sieve into a large mixing bowl. Sift the flour, sugar, and salt over the egg mixture. With an electric mixer, beat on lowest speed for 10 minutes. Increase speed to medium-low and beat 5 minutes more. Strain mixture through a fine-mesh sieve. Place empty popover pan in oven until pan is hot (about 5 minutes). Working quickly, fill each popover cup three-quarters full. Sprinkle with cheese. Immediately return pan to oven, and bake for 35 minutes or until popovers are deep golden brown (do not open the door while popovers bake as it could cause them to collapse). Remove popovers from baking pan; place on a wire rack to cool. Immediately pierce sides of popovers with a skewer to allow steam to escape so they stay crisp longer.